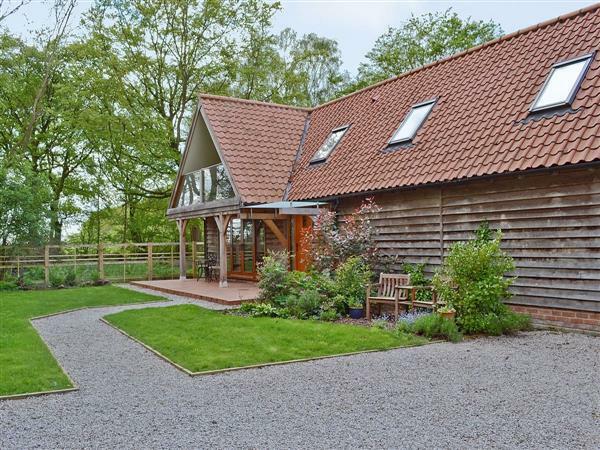 Birchwood Stable Cottage in Copmanthorpe, near York sleeps 5 people. In the woodland grounds of the owners’ home this detached, oak framed holiday cottage, formerly a stable, has been converted with great attention to detail. Surrounding country lanes allow for bike rides. Copmanthorpe offers shops, pubs and restaurants, and the city of York is nearby. Shop, pub and restaurant 1½ miles. Ground floor: Dining room with single day bed/kitchen. Utility/shower room with toilet. First floor: Living room with double sofa bed and French doors. 3 bedrooms: 1 double with en-suite bathroom with shower attachment and toilet, 1 twin, 1 single. Bathroom with shower over bath and toilet. central heating by wood chip boiler (underfloor on ground floor), electric, bed linen and towels included. Travel cot. High-chair. Freeview TV. DVD. CD. Wii. Electric cooker. Microwave. Washer/dryer. Dish washer. Fridge/Freezer. Wi-Fi. Enclosed lawned garden with terrace and furniture. Balcony. Shared grounds. Barbeque. Parking (3 cars). Cycle store. Shared tennis court. Stabling by arrangement. No smoking. Holidays run from Friday to Friday. For a better idea of where Birchwood Stable Cottage is, you can see Birchwood Stable Cottage on the map below. Birchwood Stable Cottage is in North Yorkshire; should you be on the lookout for a special offer, you can find all the special offers in North Yorkshire. It's always worth checking to see what is on offer at the moment. Do you want to holiday near Birchwood Stable Cottage (27475), you can see other cottages within 25 miles of Birchwood Stable Cottage; have a look to find your perfect holiday location.